The President’s Lecture Series will provide an opportunity for all to gather, learn and discuss the ideas and issues that animate our communities. President Bodnar looks forward to hosting a series that challenges all of us to engage in meaningful—and enjoyable—learning both on campus and in the community. "The Cultural Revolution We Need." 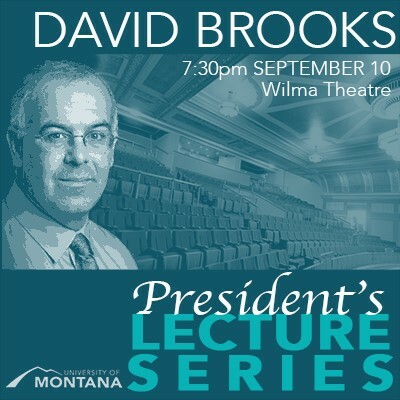 Brooks is a columnist for The New York Times, an Executive Director at the Aspen Institute and a commentator on “The PBS Newshour,” NPR’s “All Things Considered,” and NBC’s “Meet the Press.” He is the author of “Bobos In Paradise: The New Upper Class and How They Got There” and “The Social Animal: The Hidden Sources of Love, Character, and Achievement.” His fourth and most recent book, “The Road to Character,” was a #1 New York Times bestseller. Brooks also teaches at Yale University, and is a member of the American Academy of Arts & Sciences. Additional President's Lecture Series programs are available for viewing at MCAT Video On Demand.